Lowly Heathkit. “Gets no respect,” as Rodney Dangerfield might say. But I’m about to tell you about a piece of Heathkit gear every vintage radio restorer should own: the IT-28 Capacitor Checker. Sure, I know what you’re probably thinking. The trouble-free nature and accuracy of modern test equipment is just too tempting to ignore. Usually, I’d be nodding my head with you. I’m generally not a fan of vintage test equipment—tube test equipment in particular. There’s nothing more frustrating than getting all set up to work on a radio, only to be forced to stop your nailing to work on the hammer. But this is one piece of test equipment that is fairly reliable, and whose most useful functions are not easily duplicated at the low prices these testers usually command. The secret to this tester’s usefulness lies in its ability to measure capacitor leakage under working voltages from +3 to +600 volts. Countless times I’ve wondered if a capacitor I’m about to replace is responsible for the faulty performance of a certain radio stage. It’s sort of a curiosity thing with me. The IT-28’s green eye tube can easily show if a capacitor is leaky. The unit provides standardized leakages tests from a front panel switch marked “Electrolytics”, “Miniature Electrolytics”, and “Paper, Mylar, Etc.” Even if I intend to replace an old paper capacitor with a modern Mylar, running a leakage test on the old cap at its working voltage satisfies my curious nature. You can’t do leakage tests at working voltage with most digital testers–not unless you buy a much fancier one than is commonly available. And you’ve got to admit, the glowing green eye tube is just cool to use. Something utterly magical about it. A second great use of this tester is to season electrolytic capacitors. Many NOS modern electrolytics have been sitting on the shelf for years since they were manufactured. Put one in a radio and then hit it with full working voltage, and you sometimes get the sound and smell of an instant barbeque—one you’d rather avoid. You can use the IT-28 to easily bring an electrolytic up to its full working voltage in incremental steps, all the while monitoring the eye tube for leakage. I do this with every new electrolytic I replace. Some of the new electrolytics in my parts inventory have sat, unused, for a decade or more. Who knows how long they sat on a distributor’s shelf before that. The IT-28 will save you from all those unnecessary radio fireworks. Heathkit introduced an earlier version of this tester in 1961 as the IT-11. Minor changes were made in 1968, and the updated model became the IT-28. The IT-28 was available until 1977—a 16 year life for the line. 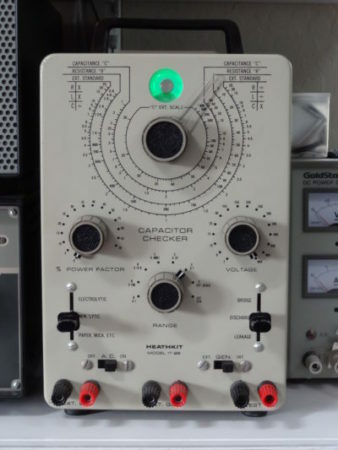 The IT-28 featured Heathkit’s tan color scheme, a grounded three-wire power cord, a spring-clamp on the 6AX4 rectifier tube socket, and a power transformer that could be wired for 240 volts. Unlike the earlier IT-11, which used adjustable set-screw knobs, the IT-28 used less desirable push-on knobs that can’t be easily re-adjusted. If you spot one any of these testers at a swapmeet, by all means grab it, fix it, and use it! Happy testing. Tom, great article. Excellent photo. Keep these coming! Nice article. Nice to see these old pieces of test gear still being used. I must point out, that the eye tube is a 1629, not an 1829. Of course as usual, all old tube gear should be re-capped for any kind of reliability. That includes this IT-28 or IT-11. Hi Rich, I haven’t had to work on many tube testers, aside from having to replace the occasional worn out socket. I guess I’ve been lucky that my Hickok 539C and B&K 707 have treated me fairly well so far. Just bought one of these on Ebay, smells like an ash tray and inside filthy. From the replacement tubes my guess is it has seen a lot of use. I am going to replace the caps and put on my workbench so it will be ready the next time I need it. Quite interesting and useful advice. Saved to my bookmarks . The earlier edition of this tester is the IT-11. The ’28 got a face lift, better knobs, and a three wire power cord. Otherwise they are identical instruments. I just restored an ’11 for the shop. Recapped and calibrated, I was surprised how well it registers capacitor leakage, having depended for years on my trusty TO-4. One of Heath’s best thought out instruments, IMO. I bought a handful of those “top hat” knobs, used on the IT-28 Lever Switches, for 25c each at a music store in Santa Clara. These are the same knobs used on the pickup selector switch on Fender Telecaster guitars. They’re very common and available wherever electric guitar parts are sold. Apparently they fall off after a while!